The BP-82E Lockbolt All-In-One installs Huck and Avdel Lockbolts. This tool uses 5500 lbs. of pulling force to install Magnagrip and Maxlok pin and collar fasteners. The BP-82E sets 3/16 and 1/4 lockbolts, which includes Huck C6L and Magnagrip and Avdel Cherry Texron Avdelok and Maxlok. This Huckbolt tool is ideal for many truck and trailer repair applications. It is also designed to install the C98LT stainless steel polished Huck bolts used on the Peterbilt Truck Cab grills. This style of tool is often referred to as a Huck tool. This is like our heavy duty riveter, Big Blue, but without the steroids. Big Blue Junior has the power of the large “heavy duty” riveters in the body of a small one. This tool simply has more pulling force than other tools in its weight class. This is our “full range riveter”. 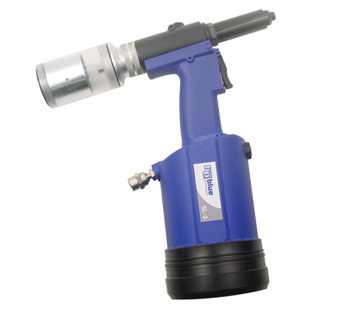 Big blue Jr. is ideal for multi-grip rivets and pulls 3/16 Monobolt/Magna-lok structural rivets. This tool provides an economical light-weight solution to placing a wide range of rivets. Our Power Micro rivet tool is the smallest and most powerful riveter on the market. This rivet tool allows the operator to easily install blind rivets in spaces were access and space is limited. 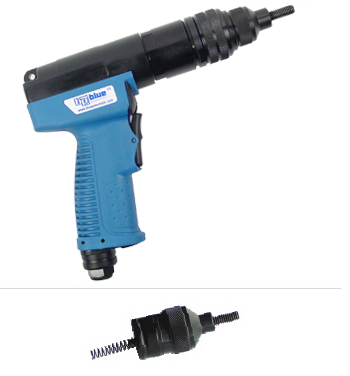 Our hydraulic Power Micro riveter installs 3/32, 1/8 and 5/32 blind rivets in all materials. More Power means this rivet tool also has the most impressive size to power ratio available anywhere. This rivet tool weighs in at 2.4 lbs and has 1760 lbs. of pulling force. SuperLight SL-3 Mercedes at Toyota price? If you had choice between a Mercedes and an Toyota. Of coarse the same catagory of vehicle, which one would you choose? Well, to be fair, some might choose the Toyota. Most equate Mercedes with quality and high price. The SL-3 is affordable luxury because you get all of the features of the super high end riveters the kind you might find in the plant at General Motors or Boeing or other super production operations. Throught our production techneques we have made the features like the light-weight and the extra long rivet stroke accessable for the other 80% of the market that can not justify the price GM might pay. Yes, Finally luxury that everyone can afford!